This year I want to be leaner and meaner. I asked you to join me in getting sweaty, fitter, leaner and stronger. How's that getting on I hear you ask. January's long gone, Fit February whizzed away like a Tour de France cyclist and now Easter is slowly creeping on us. I'll admit, it's been a bit of a rollercoaster ride; there's been ups and downs. I quit my gym in December, and being gym-less for a few months was a little difficult for me to get used to, because, well, the gym is like a second home for me. But don't get me wrong, I have been keeping active; there were the Edge Cycle classes, the MoreFit personal training sessions, and not forgetting my half-marathon training. In collaboration with Fat Face, this post is all about how I motivate myself and keep myself from falling off the fitness wagon. Being a gym-lover, you can guess what my first tip will be about....the gym! Find a gym that suits your needs and matches your personality. 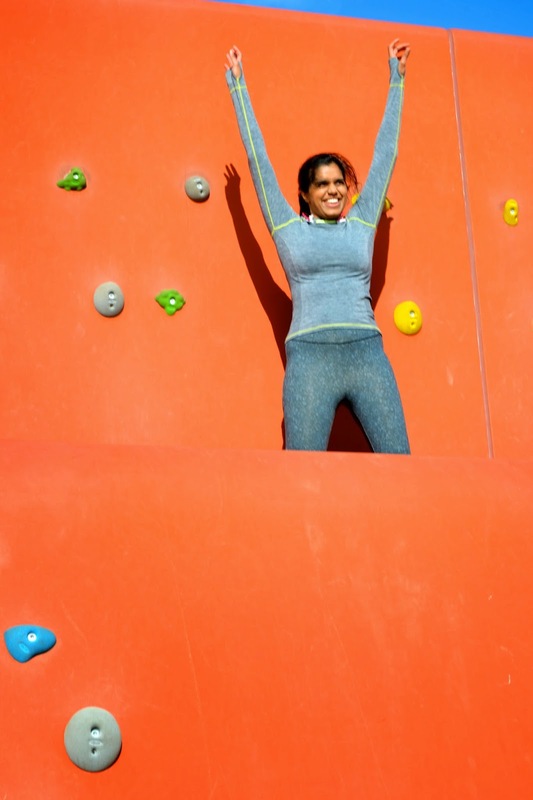 I signed up with GymBox because we share the same ethos about pushing yourself beyond your limits. It's bold, bright and the personal trainers and class instructors sure know how to keep you on your toes. I had considered joining up with two other gyms, but I found them too clinical and a little sttifling. GymBox have live DJs in the evenings and their gym space is huge - with an amazing view of the Olympic Park. Don't get me started on the huge range of classes they have as well. This place is a completely different world to my previous gym. I feel like I'm going to thrive and improve here. Sense my excitement with GymBox? If you're not sure where to look, Twitter is where you should start your search. If I see any free events, I will tweet about them too. As a runner, having a race calendar is another way to keep me motivated. This year my aim is to complete at least 10 races - so far I have 6 planned! I know that the registration fee for running events can be a bit of a blow to the bank account but there are plenty of ways to register for free. Registering with a charity is the most popular. There are also some events that provide a limited number of free entries to local residents. Have a look out in your local magazine or newspaper for these. Some events, like the City of London Mile, offer free entry for all. Spacing my races across the year, and taking part in different distance lengths not only keeps me on my toes, but equally motivates me. This year, my running events range from 1 mile to half-marathon distances. Personal experience has led me to find that training for the different distances differs, which means my training and workouts overall are never the same. 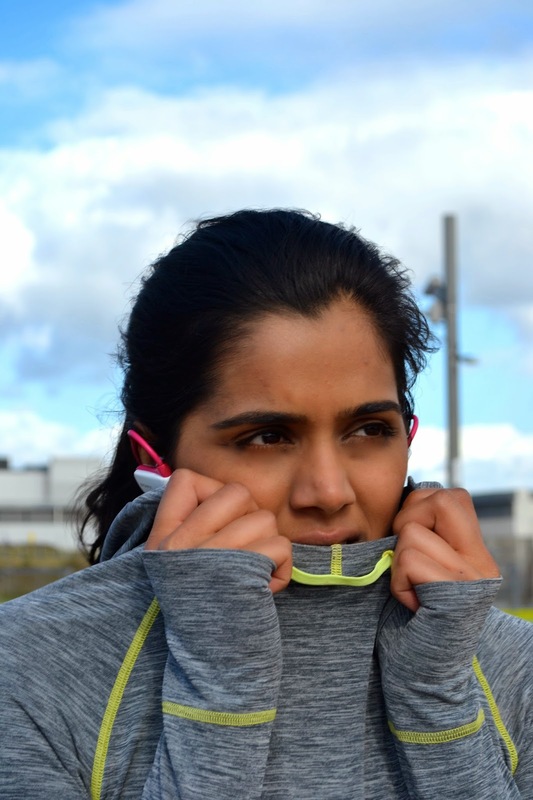 So you've booked your races, but you're running low on motivation (pun just noted!). Now more than ever, sportswear and high street brands have understood the notion of 'look good, feel good.' There's something so satisfying and therapeutic with sportswear shopping. I am a completely different person in terms of the designs and colours of my lycra choices to casual and workwear... hello wild child! 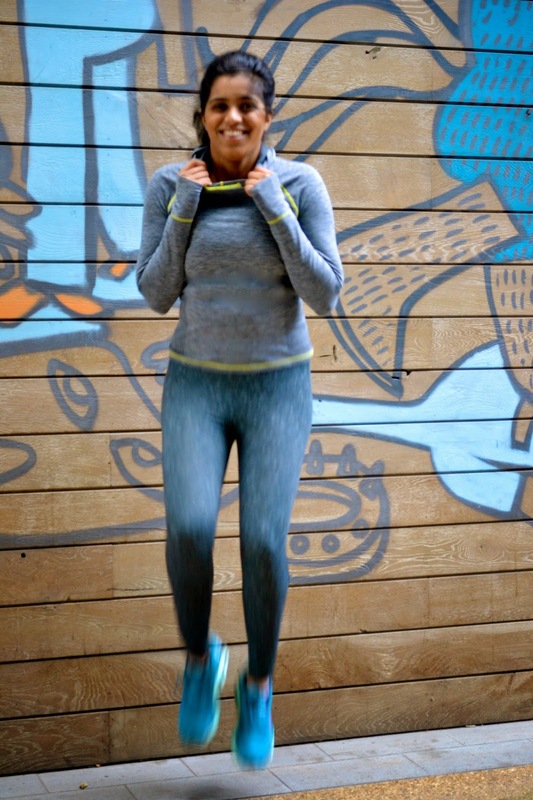 Fat Face's activewear range is part of my updated sports wardrobe. I love that they are perfect for both outdoor and indoor workouts. 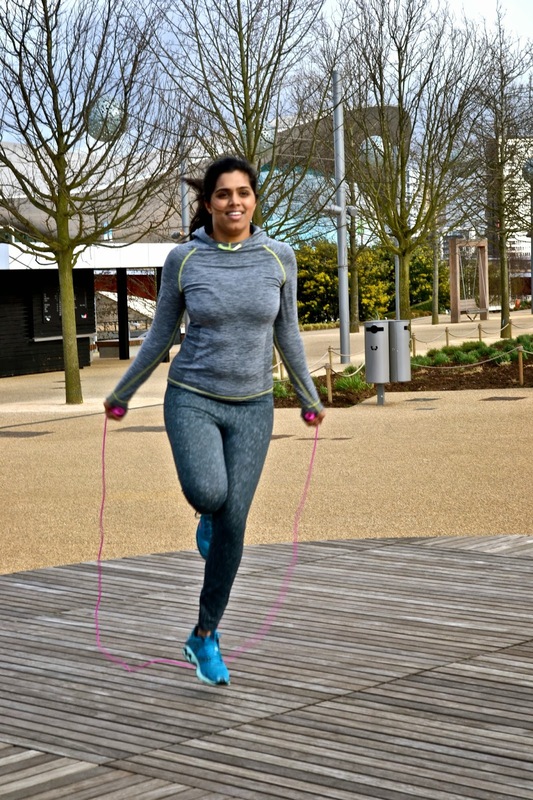 When I participated in one of Lexie's free classes in February, I learnt about using the city and open space as your gym. We used the Boris Bike stations to run in and out of, sprinted up the stairs next to the Broadgate Tower near Liverpool Street Station, and at one point, we did 100 squats in a group circle....my legs felt dead the next morning! 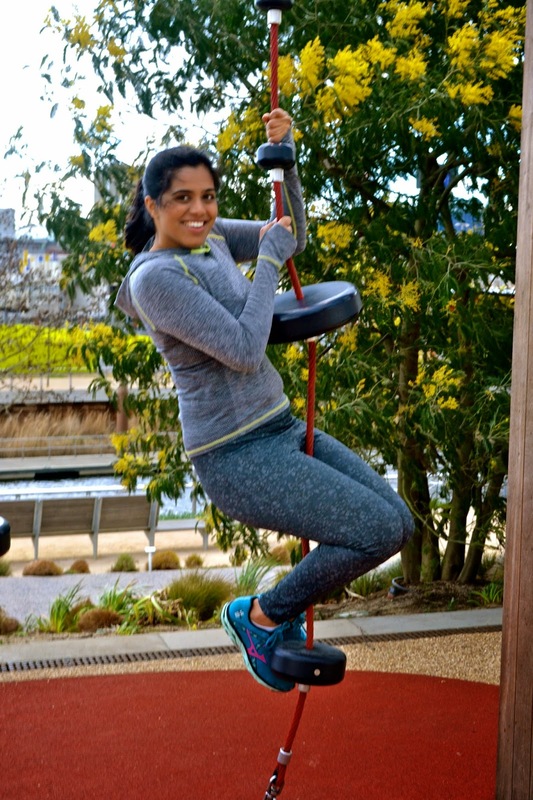 I love using the Olympic Park as an outdoor gym space. It's a ginormous playground for both adults and children. But there's also time for self-reflection. The Fat Face hoody is perfect for the current spring weather. I love the sides of the hoody too. The leggings are high waisted, so when the sun comes out, these will look great with a cropped top, or a sports bra. The leggings' sizing is much more roomier than other brands, and I'd recommend going down a size. (I'm wearing a medium, but a small would have been a better size on me). I love the simplicity of the hoody, with the high neck and pop of yellow drawstring and yellow stitching; at the moment, I'm obsessed with yellow in sportswear....did you see my Hampton Court Palace Half Marathon running gear? Hello, yellow! The thumbhole is another reason why I love the hoody and is also another sportswear feature I'm currently obsessed with. When we were at school, we would play lots of games and sing lots of chants with the skipping rope. Nowadays, I love taking the skipping rope with me on a run. Occasionally, I might stop and skip one jumps, or on one leg for about 50-100. Updating my mp3 player is equally important to me. I'm one of those people who feel so demotivated when running or working out without any music. Currently Beyonce, Justin Timberlake, Whitney Houston and a load of 90s pop power me through. My Sony Walkman is amazing. It's hands-free, no-wire design, and the actual music player is incorporated into the headphones, so no fidgeting around in pockets or arm straps. Changing my workouts on a weekly basis keeps me from falling off the fitness wagon. GymBox offers such a large range of classes and has a huge gym space with so much more equipment than my previous gym, that changing up my workouts isn't proving too difficult so far. If the gym isn't your kind of thing, Class Pass has just launched in London. For a monthly fee, you have access to a wide range of classes at different places across the city. One day you could be spin cycling, the next day you might be at a bootcamp. This is one New York import that has my approval! ....And relax. If you're aching the next day, take a day off. Walk if you don't want to be too inactive, take a bubble bath with arnica, catch up with friends. Just don't work out otherwise you'll burn out. Let's all be a winner! Let me know how your New Year's resolutions are going along, and how are your workouts.It's never too late to jump back on the fitness wagon! Disclaimer: This feature was in collaboration with Fat Face. I was given the top and leggings of my choice, however all opinions are honest and my own.